The Pink-eared Duck Malacorhynchus membranaceus has to be my favourite duck! For obvious reasons it has listed under “other names” in field guides “Zebra Duck” and it is easily identified from all other duck species in Australia by its distinct stripes. The “pink ear” is a very small pink area just above the eye and is not as easily observed as the stripes, so no big surprise that it could be called a Zebra Duck. It has a very square bill and is often encountered in quite large flocks dabbling in water feeding. The Pink-eared Duck is very nomadic and there can be hundreds of these birds at a particular location one day and all gone the next. It is a species we have not seen in flight dispersing to a new location, but they often fly up and back down rather vocally if disturbed. 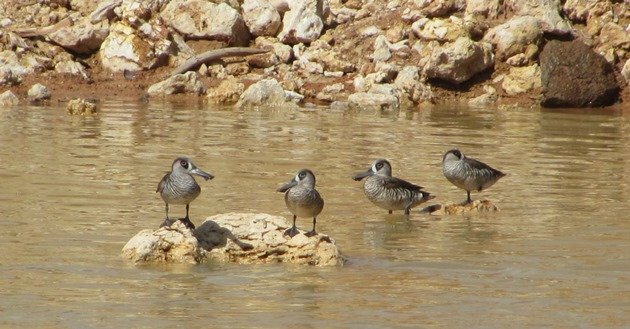 On some occasions when we visit our Broome Poo Ponds there are good numbers, but currently there are very few birds of any species at all due to our recent rains. 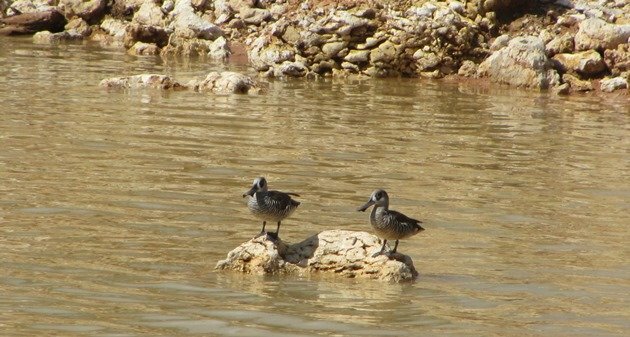 On our trip to Palm Springs last year we visited the Halls Creek Poo Ponds and that was an excellent place for bird watching and even better was the fact that there were Pink-eared Ducks present. Even a trip to Perth in 2011 we were able to get our fix of Pink-eared Ducks at Herdsman Lake, so it is a duck that you can observe across Australia, though they do prefer inland lakes in general. Their movements and breeding is determined by rainfall and for that reason they are not always where you think they might be. 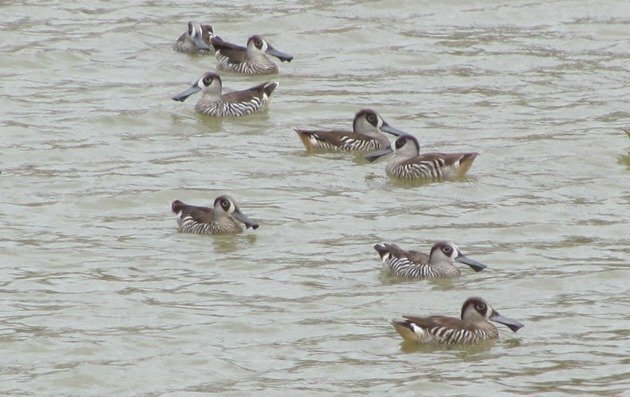 With the rain forecast at the end of 2013 and with Cyclone Christine heading our way we headed inland a few kilometres to look for Pink-eared Ducks because they were no longer present in Broome at the Poo Ponds. All of the ephemeral lakes had very low water levels and it was extremely windy. The birds present were feeding rapidly as if they were anticipating the weather that was approaching from the north. There were no ducks at the lake, but at a quarry that had filled with rain water they were bobbing around and also sheltered somewhat from the wind. It was quite rough on the water with the wind, though. Only three days later and after torrential rain, but eager to get a start on the 2014 year list we returned to the ephemeral lakes. By now the lakes were very full and there were no muddy edges. The Little Curlew had gone along with the Wood Sandpipers and Sharp-tailed Sandpipers. The list was going to suffer due to the rain and the dispersal of so many of the bird species that we saw only three days earlier. We returned to the quarry in the hope that the Pink-eared Ducks had remained through the wet and windy weather and we were relieved to see them still present. The majority were out of the water and had chosen to rest on exposed rocks. 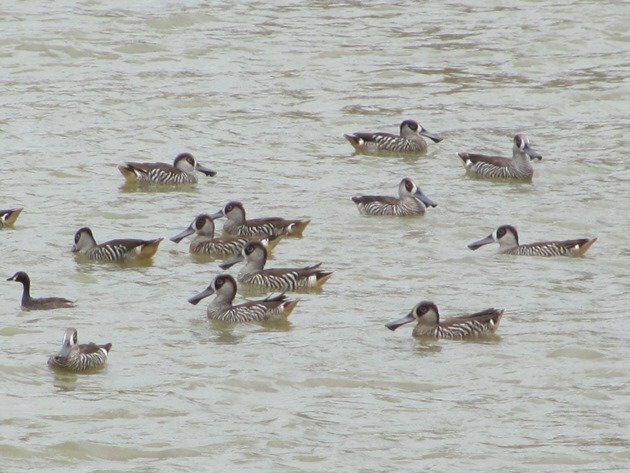 There are now a lot of ducks dispersed around the Broome area and they include Wandering Whistling Ducks, Plumed Whistling Ducks, Grey Teal, Hardheads and Pacific Black Ducks. 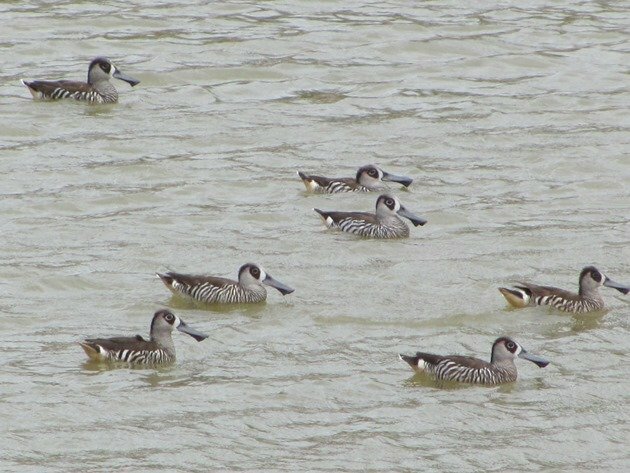 They are all great ducks, but the Pink-eared Ducks have to be my favourite duck! Could you recommend a field guide for your area? I have found from reading 10,000 Birds that I like to read more about the birds that you and the other beat writers from other countries post about. So last summer I purchased the Birds of Europe and now I’m looking to buy one for Australia. There are four good Field Guides and most recently updated is Graham Pizzey and Frank Knight. The other three are Ken Simpson and Nicholas Day, Michael Morcombe and Peter, Pat and Raoul Slater. They are all similar, though vary slightly with the information provided-not all listing eggs and nests. We use all four for reference due to the fact that we live in Australia and there are electronic versions, but we have not used any of them-preferring books! They are all priced similarly and readily available. What a cool looking bird. Great post, and an amazing bird! I do prefer the zebra name, with those fabulous stripes. Can you explain about its bill? It looks quite unique, though similar to our Northern Shoveler’s, which is a long spatulate bill for scooping up invertebrates, seeds, and plants from the mud. 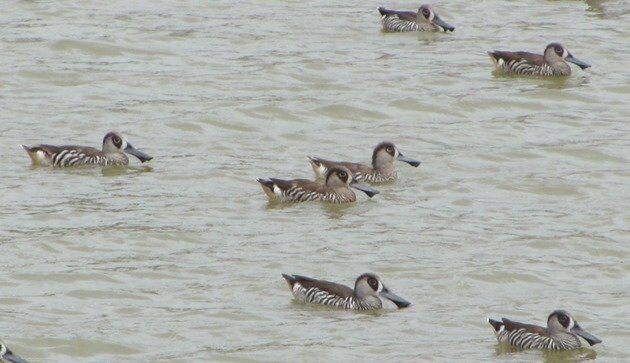 The Pink-eared Duck’s bill looks maybe like it has one or two knobs or something on the end? The bill is indeed spatulated like a Shoveler’s bill, hence appearing like it has knobs! It is the downward curve at the end giving the odd appearance!